Join the amazing Reef 'N Raft package and see all the best parts of the Whitsundays! Not only will you get to see the stunning island archipelago, but you will also get to spend a whole day on the Great Barrier Reef - one of the 7 natural wonders of the world! 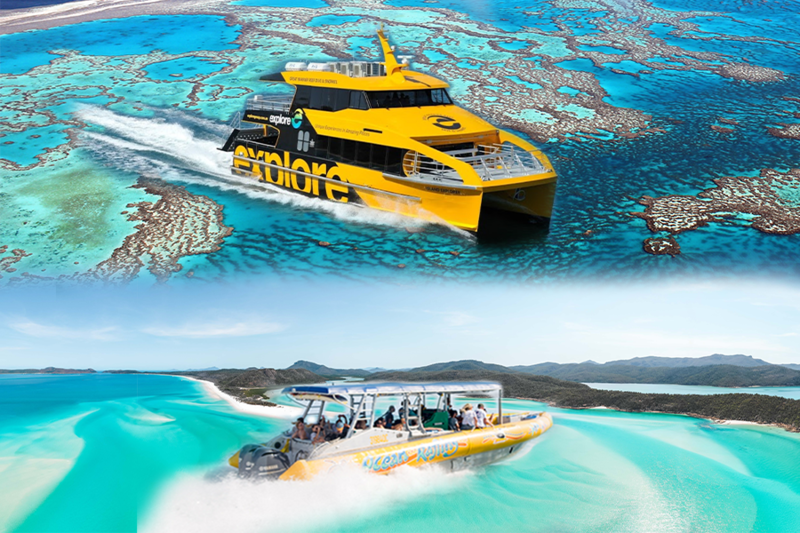 This unique combo will allow you to see at least two different types of reefs, as well as Whitehaven Beach and the famous Hill Inlet lookout. Spread over two days, you will join two separate tours that each offer a unique perspective on arguably the most beautiful place in Australia. Fast and adventurous day tour! Choose between two award-winning tour options. Southern Lights - More time at the beach! Northern Exposure - More time snorkelling! Ocean Rafting offers award-winning tours that visit with "wild side" of the Whitsundays! Whether you choose to pick the Northern Exposure tour for more time snorkelling, or the Southern Lights tour for more time at the beach, both tours will make sure you see it all! Ocean Rafting are the only tour operator to have direct access to the stunning and iconic Hill Inlet beach and special snorkel sites at Hook Island and Border Island! Each Ocean Rafting vessel is custom-made with a unique design offering a comfortable, fun and speedy ride from one place to the next. Their fleet of seven vessels are 12 metre semi-rigid inflatables, originally designed and built as rescue crafts and are driven by 500hp engines! Ocean Rafting offers the funnest and fastest tours in the Whitsundays! Hop on board and see all the best parts of the Whitsundays, venturing to the fringing reefs, Whitehaven Beach and Hill Inlet lookout. Each and every tour is unforgettable, where you can enjoy every minute of your day that will include exploring new places, trying new things and taking in the sights! As a multi-award winner, Ocean Rafting is dedicated to both preserving the Great Barrier Reef and supporting our tourism industry.